Recent estimates count more than 2 million post-9/11 military veterans. The National Bureau of Labor Statistics has reported that unemployment rates among veterans was 10 percent in August of this year. The RAND Center for Military Health Policy Research reported that nearly 20 percent of veterans returning from Iraq and Afghanistan suffered from major depression or post-traumatic stress disorder. And, according to the U.S. Census Bureau, 5.5 million veterans in 2008 were living with some type of disability. As a reflection of U.S. society, many of these veterans need a variety of services related to physical and/or mental impairments, and the numbers will only continue to grow. At 4:30 p.m. Wednesday, Nov. 6, the NIU Counseling Association will address these topics and more in a special presentation in honor of Veterans’ Day. 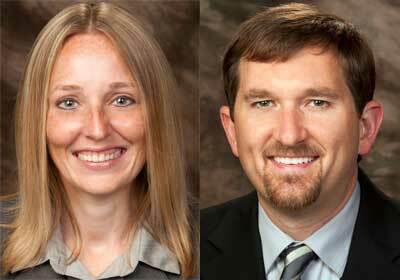 NIUCA will host “Counseling Veterans with Disabilities: A Special Veterans Day Presentation” featuring Amanda McCarthy and Bryan Dallas, the newest faculty of NIU’s Rehabilitation Services/Counseling program. McCarthy and Dallas will provide an overview of veterans who have disabilities, their current needs, prevalent service-connected impairments, interventions aimed at supporting veterans (including vocational counseling), as well as assistive technology used to facilitate independence in personal and vocational settings. 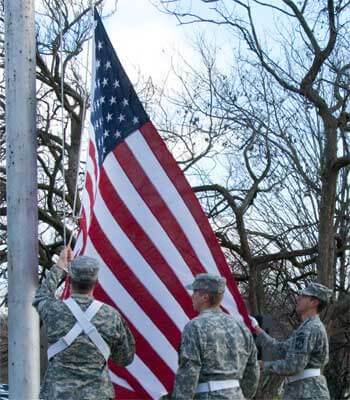 NIU ROTC members lower the flag at the 2012 Veterans Day service. A question-and-answer session will follow the presentation in Room 423 of Graham Hall. It is free and open to the public but might prove especially useful for counselors, psychologists, educators and those in the allied health professions. “Regardless of specialization or setting, counselors should consider gaining some basic knowledge about veterans with disabilities. Making an effort to understand the veteran’s individual life experience and gaining familiarity with resources for veterans is a starting place to getting veterans the mental health, career or rehabilitation counseling services they need and deserve,” McCarthy said. The National Board of Certified Counselors will provide 1.5 Continuing Education Units. NIU’s Counseling Program is an NBCC-approved Continuing Education Provider (ACEP) and can offer NBCC-approved clock hours for events that meet NBCC requirements. The ACEP solely is responsible for all aspects of the program.